HSH was proud to volunteer during today’s lunch hour at Rosie’s Place – America’s first sanctuary for poor and homeless women. 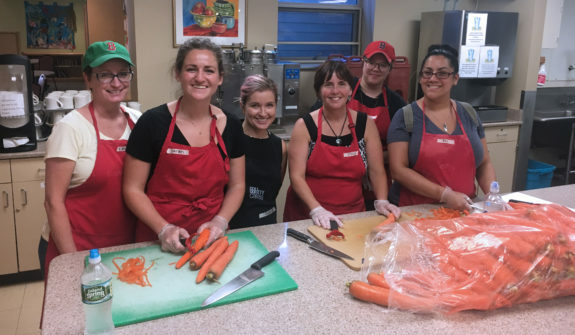 A group of employees headed over to the South End to help prepare and serve today’s lunch – beef and vegetable soup, pineapple chicken, brown rice, and veggies were on the menu! Though not all of us are experienced cooks, the meal we served was truly delicious, thanks to the guidance and organization of the amazing staff. Rosie’s place provides lunch and dinner to an average of 220 women in Boston every day, in addition to many other services. Find out more, and sign up to volunteer and support their mission at www.rosiesplace.org. Pictured left to right: Elaine Canepa, Sarah Davis, Kate Andrews, Kelly Pelland, Olga Dudkin, and Ziomara Ayala-Mendoza.